You might have seen my recent post for Ginger Syrup. Well, I enjoyed it so much, I just made another batch today. It's like liquid gingersnaps. So yummy! And so versatile, too. On that first post, I gave some serving suggestions. Here you have another one. This shake has a bit of Asian flare and would be the perfect dessert to follow a Chinese or Thai meal (though it would be just as delicious alongside your favorite burger). You can also serve with ginger cookies or garnish with cookie crumbs if you'd like. The shake in the photo is topped with whipped cream. Once you have the syrup, this is a quick and easy treat - and a pleaser, too. 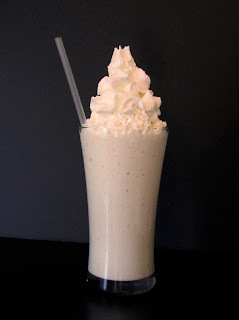 The recipe makes two large shakes. 1. Scoop the ice cream into the blender (in scoops, not a huge chunk) along with the other ingredients.